﻿﻿ Ayurveda is the sister science of yoga, practiced in India for more than 5000 years. Some say it is the world's oldest health care system! Ayurveda promotes vitality by removing toxins from the body, and harmonizing body, mind and spirit using foods, spices, herbs, and mantras. You can determine your personal Dosha or constitution by taking this Dosha Quiz from the Chopra Center or this one from Doctor Oz or this one from Yoga Journal. Ayurvedic teas are a wonderful way to introduce this ancient wisdom to your life. They are delicious, and easy to make from herbs and spices in your garden, whole foods store, or your favorite Indian grocer. Here are three recipes that calm and energize the body and mind without caffeine. They also promote healthy digestive and immune systems. Click here for the recipe source and more information about their indications and benefits. 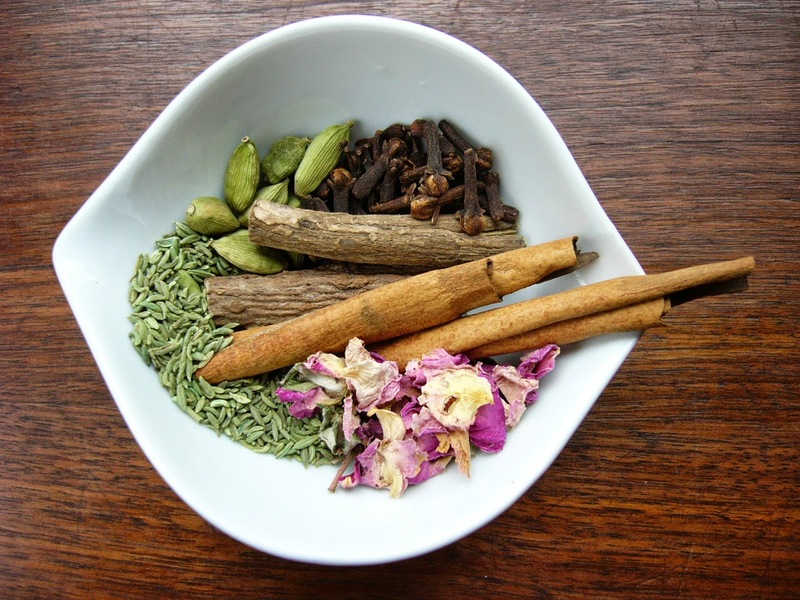 Vata Chai: Licorice root, cinnamon, ginger, cloves, fennel, and stevia. Pitta Chai: Licorice root, rose petals, fennel, cardamom, ginger, and stevia. Kapha Chai: Ginger, licorice root, cinnamon, cloves, black pepper, and cardamom﻿. Drink to your pleasure and health!